A father writes a letter to his children, who are away visiting grandparents. The letter tells the story of a tree, and also of the family through the years. The family bought some land to build a house. When they all went to see the land, the children found a large tree that held their attention. The youngest child, who couldn’t say ‘tree,’ called the tree ‘Steve.’ The parents asked the builders not to cut Steve down during the house construction. Steve was there from the start, and became a part of the family’s life, holding swings and jump ropes, standing as third base, or a hiding place. Steve stood through snowstorms, an overflowing sewer, a tree doctor visit, and many other events. The father concludes the letter explaining that a storm came through their area, and that they couldn’t save Steve from the storm. The huge tree snapped and fell over. 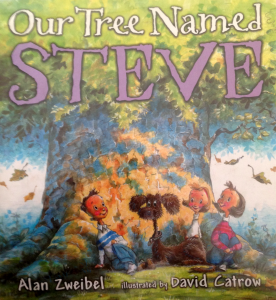 The book ends with a picture of a new tree house in another tree, perhaps made of Steve’s wood, and the family dog standing on a huge stump. The illustrations are lively, and bring the story to life. This is a fun picture book to share with your family.